High above the Pacific Ocean in a plane headed for Hong Kong, most of the passengers are fast asleep. But not Jim Puckett. His eyes are fixed on the glowing screen of his laptop. Little orange markers dot a satellite image. He squints at the pixelated terrain trying to make out telltale signs. 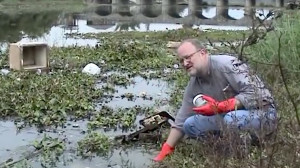 He’s searching for America’s electronic waste. “People have the right to know where their stuff goes,” he says. Dead electronics make up the world’s fastest-growing source of waste. 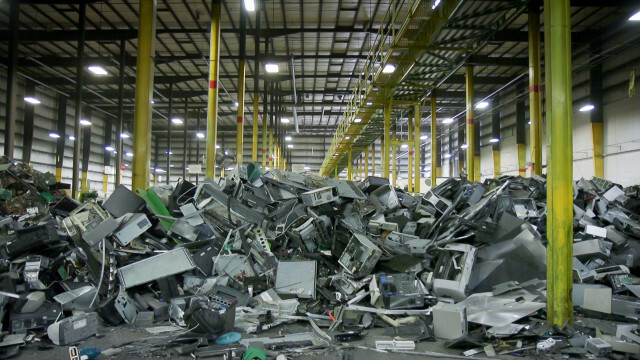 The United States produces more e-waste than any country in the world. Electronics contain toxic materials like lead and mercury, which can harm the environment and people. Americans send about 50,000 dump trucks worth of electronics to recyclers each year. But a two-year investigation by the Basel Action Network, a Seattle-based e-waste watchdog group, concluded that sometimes businesses are exporting electronics rather than recycling them. About a third of the tracked electronics went overseas — some as far as 12,000 miles. That includes six of the 14 tracker-equipped electronics that Puckett’s group dropped off to be recycled in Washington and Oregon. The tracked electronics ended up in Mexico, Taiwan, China, Pakistan, Thailand, Dominican Republic, Canada and Kenya. Most often, they traveled across the Pacific to rural Hong Kong. It’s the same route Puckett is taking now. The next morning Puckett follows the little orange markers to a region of Hong Kong called the New Territories, a long-time agricultural area along the border with mainland China that’s shifted toward industry in recent decades. He teams up with a Chinese journalist and translator, Dongxia Su, and a local driver, who will help navigate the region. They follow a set of GPS coordinates for one of the tracked electronics. Paved streets become rutted dirt roads. They pass a steady stream of trucks carrying shipping containers from the port. As they approach their first destination — “One-hundred feet away. Eighty feet. Seventy-seven feet,” Puckett says — they hear sounds of power drills and shattering glass. It’s coming from the other side of a high metal wall made from old shipping containers. Su pounds on the front gate, and the drilling stops. A worker shouts from beyond the fence and Su tells him the group is shopping for used electronics. She says they want to fill a shipping container with printers to refurbish and sell in Pakistan. The door opens. Inside, workers are dismantling LCD TVs. The ground at their feet is littered with broken white tubes. These fluorescent lamps were made to light up flat-screens. When they break they release invisible mercury vapor. Even a minuscule amount of mercury can be a neurotoxin. The workers aren’t wearing protective face masks. One worker says he isn’t aware of the risks. “He had no idea,” Su says, after speaking with him in Mandarin. 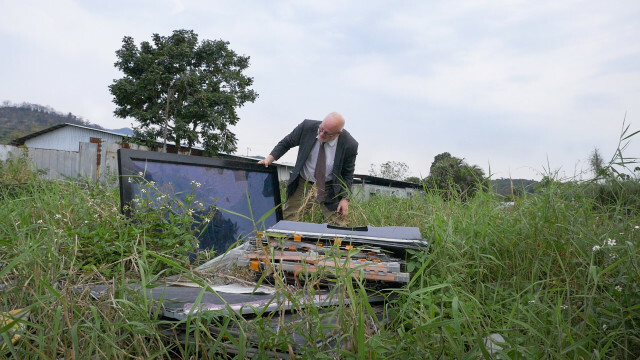 The New Territories used to serve only as a pass-through for smuggled e-waste, Puckett said, where workers would unload shipping containers and put electronics on smaller trucks bound for mainland China. But a crackdown by the Chinese government on whole electronic imports, part of a border control operation called “Green Fence,” has prevented many electronics from moving across the border. “Now they’re doing the processing here,” he said. Puckett has been investigating the afterlife of consumer electronics for nearly two decades. Over the years, his team staked out U.S. recycling operations and followed shipping containers overseas to uncover the environmental and human health consequences of the global e-waste trade. Many U.S. consumers got their first glimpse of what happens to their discarded electronics in Puckett’s 2001 film “Exporting Harm: The High-Tech Trashing of Asia.” It captured the crude recycling methods taking place in Guiyu, a cluster of villages in southeastern China that has since become known as the world’s biggest graveyard for America’s electronic junk. Puckett’s documentary came out more than a decade after nearly every developed nation on the globe had ratified the Basel Convention, an international treaty to stop developed countries from dumping hazardous waste on poorer nations. Now, more than a quarter-century after that treaty was written, and more than 15 years since he exposed Guiyu, Puckett said little has changed. The United States is the only industrialized country in the world that hasn’t ratified the treaty. Its hazardous waste is still getting exported to countries with fewer health and environmental safety laws, according to Puckett’s latest investigation. Over the years Puckett’s attempts to quantify and draw attention to exported electronic waste has drawn criticism from U.S. recyclers who say the problem has been exaggerated. Estimates of U.S. e-waste exports vary widely. 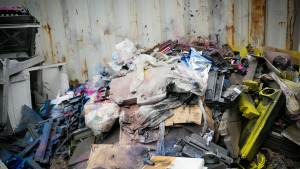 The United Nations says that between 10 and 40 percent of U.S. e-waste gets exported for dismantling. While the International Trade Commission — through a survey of recyclers — said in 2013 that a mere 0.13 percent of all used electronics collected in the U.S. went abroad for dismantling. Puckett turned to GPS tracking technology as a new tool to determine just how big the e-waste export problem really might be. He partnered with Carlo Ratti of the Senseable City Lab at MIT to deploy the strategy. Puckett’s GPS receiver leads the way to another set of high fences. A sign out front proclaims that it’s farmland. But a look over the fence reveals a lot the size of a football field piled 15 feet high with printers. Workers are breaking them. Their clothes are dusted black with toner ink, a probable carcinogen known to cause respiratory problems. Su talks to the workers and finds out many are migrants from mainland China, who are residing in Hong Kong without the official documents required for them to legally be there, she says. That doesn’t surprise Jackson Lau, director of the Hong Kong Recycle Materials and Reproduction Business General Association. 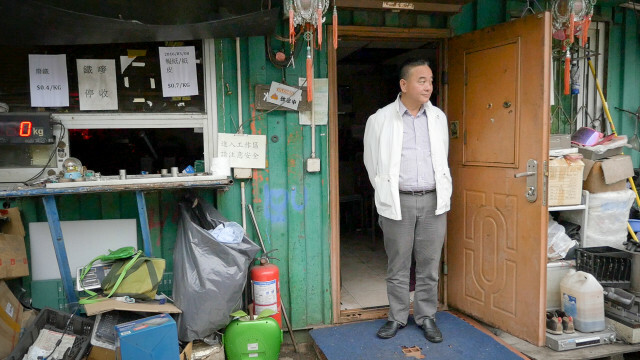 “The majority of these workshops tend to operate in a shady manner,” unlicensed and poorly regulated, said Lau, a licensed, second-generation paper and plastics recycler in the region. Electronics are often labeled as raw plastics to get through customs, Lau said, but they’re actually whole devices that the junkyard workers dismantle. They sell the most valuable components to buyers in mainland China, while workers indiscriminately dump the worthless leftovers. 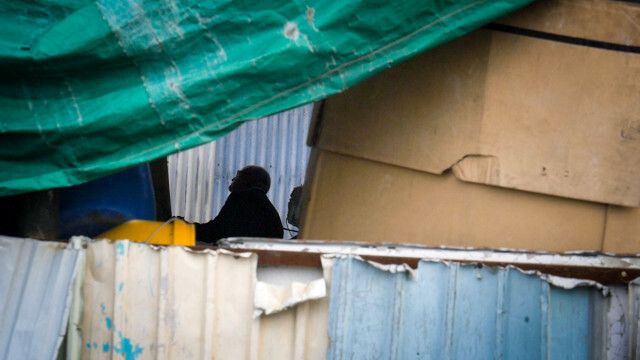 He said a lack of oversight by Hong Kong’s Environmental Protection Department is not only harming workers in the facilities but also the neighboring communities and environment. 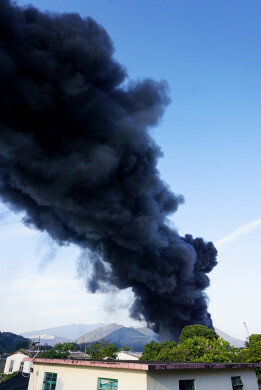 Several fires have broken out at junkyards in the past year, including two incidents in March that emitted plumes of toxic black smoke, according to local news reports. Burning e-waste is known to generate dioxins, a family of cancer-causing chemicals that endure for long periods of time in the environment and human body. More than a month after the fires, rusty metals and ashen plastics still emit chemical odors and blanket the soil along a nearby river. Cheung Kwai Choi, a farmer who has lived in the region for a half-century, said the e-waste junkyards and fires have multiplied in recent years. He recently began advocating for stronger regulations on junkyards. “On the whole, Hong Kong has been effective in combating hazardous waste shipments,” Liu said, citing 21 instances in the past three years in which cargo loads of e-waste were sent back to the U.S.
At two junkyards, Puckett finds labels from a library, a hospital and other organizations in Washington and Oregon. “It’s getting close to home,” he says. Then he finds a clue as to how these materials ended up here. Many boxes bear the logo for Total Reclaim, one of the largest electronics recyclers in the Pacific Northwest with contracts to handle e-waste from the City of Seattle,King County, the University of Washington and the State of Washington.3 It is also one of the larger recyclers operating in Oregon. Total Reclaim scored these big regional recycling contracts in part because it was certified by e-Stewards, a responsible-recycling certification program created by Puckett’s Basel Action Network. Puckett started e-Stewards in 2010 to create a set of ethical and environmentally-friendly industry standards and prevent the export of toxic materials in lieu of federal laws. Total Reclaim was a founding member. Electronics recyclers with e-Stewards certification can export the raw plastics and metals that come from dismantling electronics. But they adopt a strict no-export policy with regard to whole electronics with hazardous materials still inside. Recyclers can also exported used electronics as long as they’ve been tested and proven to be still functioning. Last May Puckett’s team dropped two non-working LCD TVs, with tracking devices placed inside, at separate recyclers in Oregon. From there, the tracked electronics traveled to Total Reclaim’s warehouse in south Seattle. Then they went to the Port of Seattle, across the Pacific Ocean to the Port of Hong Kong and ultimately to two junkyards in the New Territories. Workers at those junkyards said they import and dismantle LCDs from the United States. Total Reclaim wasn’t the only leading domestic e-waste recycler that collected non-working electronics with tracking devices inside that went overseas, the Basel Action Network concluded through its investigation. In 2004 Dell created a take-back program called Dell Reconnect. That made it the first major computer manufacturer to ban the export of non-working electronics to developing countries. The computer maker partners with the nonprofit thrift store chain Goodwill Industries, which collects any brand of old computer for free to be refurbished or recycled. The investigation focused on Dell’s program after whistleblowers drew Puckett’s attention. BAN dropped off 28 tracked electronics at participating Goodwill locations and determined that six of the tracking devices went abroad — to Hong Kong, Taiwan, mainland China and Thailand. Beth Johnson, head of Dell’s producer responsibility programs, said the company conducts regular audits of Goodwill and vets downstream recycling partners. “If there’s something that did not follow the system we would certainly want to know about it and certainly take corrective action,” Johnson said. Goodwill’s public relations official declined requests for an interview and instead issued a statement Friday after Puckett briefed officials about the findings of his group’s investigation. 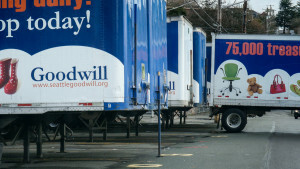 “Goodwill Industries International is committed to understanding new insights into the e-cycling space from the final report,” the statement said, and “encourages Goodwill organizations participating in the Dell Reconnect program to evaluate the continuation of their contracts with Dell” and to take steps to ensure that electronics are responsibly recycled. In all, BAN’s investigation found that 65 tracked devices went through U.S. recyclers and ended up overseas. The results showed that some of those exported electronics had been dropped off at green-certified recyclers. BAN plans to conduct further investigations before reporting more about these recyclers. On Thursday, the Basel Action Network announced that Total Reclaim was suspended from the e-Stewards program for two years. In a phone interview, co-owner Craig Lorch acknowledged that some of Total Reclaim’s LCD flatscreen monitors have been shipped to Hong Kong, despite the company’s no-export policy. Both the Oregon Department of Environmental Quality and the Washington Department of Ecology have launched investigations into whether Total Reclaim violated their state hazardous waste laws. Oregon regulators have also asked the state Department of Justice to open an investigation into whether Total Reclaim violated consumer protection laws. Lorch said economic realities forced the company to renege on pledges to recycle all the waste that they collect. In recent years, LCD monitors have become a larger portion of the waste stream, but the flat-screens are expensive and time-consuming to dismantle. “We’re struggling for survival,” he said. Prices for many commodities found in e-waste, a major source of revenue for electronics recyclers, have plunged in the past year. In January, copper fetched half its 2011 price, hitting the lowest level in seven years. Plastics prices have bottomed out, recyclers say. At the height of the market, Total Reclaim sold steel for $300 a ton. The price recently fell to $60 a ton, Lorch said. Harris, from the Institute of Scrap Recycling Industries, said those falling commodity prices have put many companies in trouble. “The last several years have been some of the most difficult times that the recycling industry has seen in decades,” he said. In a bear market for commodities, exporting waste is more profitable than processing it domestically. Recyclers simply fill a shipping container with whole electronics and an e-waste broker arranges for pick up. Printers, which hold little value, and LCD TVs, which are expensive to recycle because of the tedious dismantling work associated with mercury, make good candidates for export. Neu is the CEO of Hugo Neu, a New York-based e-waste recycler and e-Steward, that just months ago decided to shift its business model away from recycling. Now it only refurbishes electronics for resale. 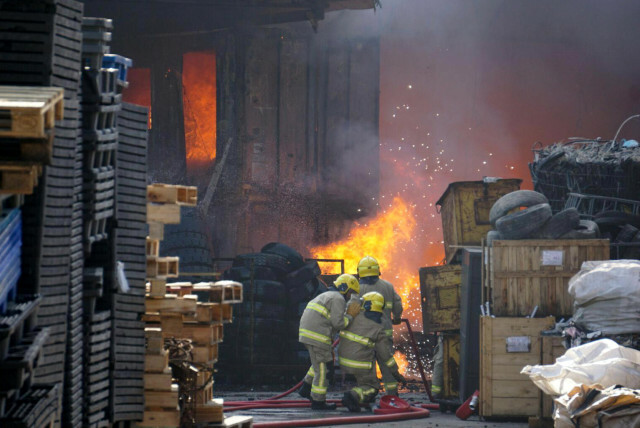 Neu, a board member of BAN, said they couldn’t compete with recyclers that spent pennies on the pound to export, while Neu’s company hired workers and paid for the latest advanced recycling technology. “The industry is not going to survive as is under the current system,” Neu said. The United States has no federal laws banning the export of e-waste.5 Bills have repeatedly failed to gain traction in Congress going back to the 1990s. The country is home to a patchwork of state laws. In half of states, landfilling electronics is legal. Some states, including Washington and Oregon, have paired landfill bans with laws that incentivize local recycling. The two Northwest states use “producer responsibility” laws similar to those in the European Union. Electronics manufacturers pay a fee to the state on electronics sold locally. The money helps subsidize approved recyclers like Total Reclaim, which recoup money through the program based on the amount of electronics the company collects. The laws aim to prevent dumping locally and abroad, assuring the public that obsolete electronics won’t get sent to third-world countries. “States are supposed to do audits that should preclude that behavior,” Harris said. But according to BAN’s tracking data, even audited companies were found to be exporting, including some in Oregon, Washington, California, Michigan and New Jersey. In addition, states don’t have jurisdiction to ban exports. Until that happens, Puckett said he assumes the problem will get worse. About 20,000 new electronic devices will be released to U.S. consumers this year. More than 1.4 billion smartphones will be sold globally, five times the amount sold five years ago. Like LCDs, CRT monitors and printers, some of those electronics may present new economic challenges for recyclers. “Until we solve this, we’ve got to keep going,” Puckett said. It’s been almost 20 years since Puckett started this fight. He said he hopes it doesn’t take another 20 to end it. Editor’s Note: Wendy Neu is a funder of PBS NewsHour.